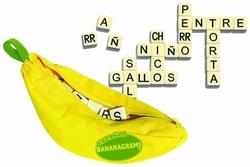 The anagram game that will drive you bananas!” Bananagrams is the first in the bunch, the game that started it all. Players race against each other to build crossword grids and use all their letter tiles. There's no turn-taking to be found here—it all happens at once and it’s a race to the finish. No matter how old you are and how many anagram games you’ve played, Bananagrams is sure to drive you absolutely bananas ... in the best possible way! Place all 144 tiles face down in the center of the table. These tiles are called the BUNCH. 2-4 People: each player takes 21 letters. 5-6 People: each player takes 15 letters. 7 People: each player takes 11 letters. Once everyone’s ready, any player can start the game by saying “SPLIT!” Everybody then turns their tiles face up and starts forming their own crossword collections of intersecting and connecting words. IMPORTANT: Words can be horizontal or vertical, going from left to right or top to bottom. Players can rearrange their own words as often as they want. There are no turns in Bananagrams, everyone works on their own crossword independently of each other. It’s a race to the finish!!! When a player successfully uses all their letters in a crossword, he or she says “PEEL!” and takes a tile from the bunch. When this happens, everybody has to take a tile and add it to their collection of letters. At any time (and as often as they like), a player can return a troublesome letter back to the bunch (face-down, of course). The catch is that they must take three letters in return. The player declares this by saying “DUMP!”. This doesn’t affect any of the other players.